The Meeting of Extended UNNExT Advisory Group on Cross-border Paperless Trade Facilitation, organized by UNESCAP, was held on 30 October – 1 November 2018 in Bangkok. The meeting brought together selected members of UNNExT Advisory Committee and relevant Advisory Groups as well as regional experts to work on legal and technical issues of facilitating cross-border paperless trade. The meeting focused on selected legal and technical work items, including legal gap checklist, technical gap checklist and mutual recognition mechanism for trade-related data and documents in electronic form. The outcome of the meeting will be used as an input for the Legal and Technical Working Groups (LTWGs) of the Interim Intergovernmental Steering Group on Cross-border Paperless Trade Facilitation in further advancing delivery of supporting documents of the draft road map. 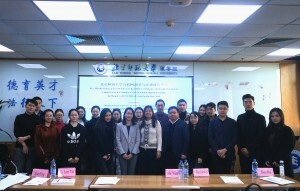 Prof. Xue is invited to give a keynote presentation on “Mutual recognition mechanism for trade related data and documents in electronic form under the Framework Agreement on Cross-border Paperless Trade”. She gave a comprehensive review of the Article 8 of the Framework Agreement and proposed the potential institutional arrangement to enable mutual recognition within the legal framework. She emphasized that whatever technical means deployed to achieve the effect the legal consistency under the Agreement has to be assured through institutional arrangement. 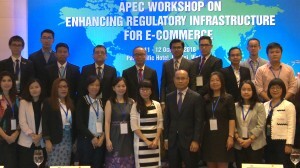 APEC Workshop on Enhancing Regulatory Infrastructure for E-Commerce was successfully held on October 11-12 in Hanoi, Vietnam. The Workshop aimed to identify the challenges, difficulties faced by the member economies in creating a favorable regulatory infrastructure e-commerce for business as well as updating e-commerce trends and issues arisen affecting the regional supply chain connectivity and institutional connectivity; share experiences, best practices from the APEC member economies especially from those economies that have developed e-commerce regulatory regimes and listen to voices of the private sectors to improve regulatory infrastructure; provide inputs for the implementation of the Phase II of the SCFAP II; and make recommendations to APEC for further consideration and action if appropriately. 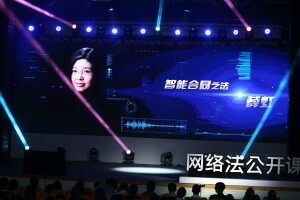 Prof. Xue was invited as the Member of APEC Expert Council on e-Business Alliance to give a keynot speech on the Chinese E-Commerce Law and New Regulatory Environment. Officials from 21 APEC economies showed great interests in the Chinese new Law and raised many thoughtful questions. 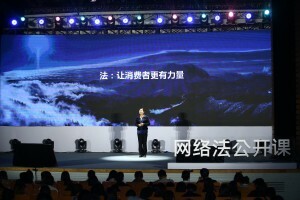 Prof. Xue explained the categories of e-commerce operators, responsibilities and liabilities of e-commerce platform operators in details to the audience. 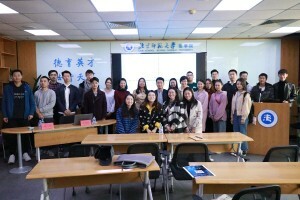 Prof. Xue also led the group discussion on the role of the individual government and APEC to play for an enabling regulatory environment for e-commerce. 09.00 – 09.10 Opening Speech By Mr Luong Hoang Thai, Director General, Multilateral Trade Policy Department, Ministry of Industry and Trade, Viet Nam. 09.20 – 10.00 Session 1: Overview of E-Commerce and the Study on E-Commerce regulations In this session, the speaker(s) will give an overview of e-commerce, its trends, current regulations, opportunities and challenges that affect business. Moderator: Dr Toh See Kiat, Chairman, Goodwins Law Corporation and Commerce Net Singapore Limited. 10.35 – 11.45 Session 2: New emerging and cross-cutting issues of e-commerce regulations (PANELIST)In this session, it will focus on new emerging and cross-cutting issues of e-commerce regulations, exposed challenges in e-commerce from various aspects such as regulations, business capacity, markets, competitiveness, etc., with views of identifying and providing inputs for further discussion and addressing the issues. - Dr Toh See Kiat, Chairman, Goodwins Law Corporation and CommerceNet Singapore Limited. 14.00 – 15.10 Session 3: Sharing experiences in developing regulations for e-commerce In this session, the member economies will share their experiences in enhancing regulatory infrastructure for e-commerce as well as highlight their legislations in e-commerce. 15.50 – 16.50 Session 4: E – Commerce Regulations from the perspective of the private sectorIn this session, the private sector will raise voices to contribute to e-commerce regulations with views of enhancing its regulatory infrastructure to enhance business practices and efficiency in e-commerce. 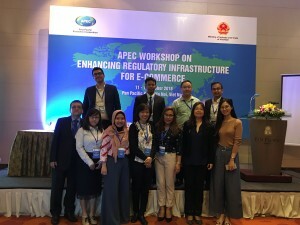 09.00 – 09.45 Session 5: E-Commerce and the APEC Supply Chain Connectivity Framework Action Plan 2017 – 2020 (SCFAP II) (PANELIST)In this session, it will focus on e-commerce regulations as one of key components to improve supply chain connectivity in general, the APEC Supply Chain Connectivity Framework Action Plan 2017 – 2020 (SCFAP II) in particular. The speakers will present and share views on how member economies’ promulgation of e-commerce regulations can contribute to the SCFAP II. (i) What should individual government do to enhance regulatory infrastructure in e-commerce? (ii) What are the APEC’s roles? 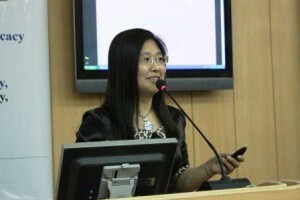 Facilitator 1: Dr Hong Xue. 11.50 – 12.00 Closing By Ms Pham Quynh Mai, Viet Nam Senior Official to APEC, Deputy Director General, Multilateral Trade Policy Department, Ministry of Industry and Trade, Viet Nam.